Spencer Fowers, senior technical staff member of Microsoft's special projects research group, seals a logo onto Project Natick's Northern Isles datacenter in preparation for deployment near Scotland's Orkney Islands. 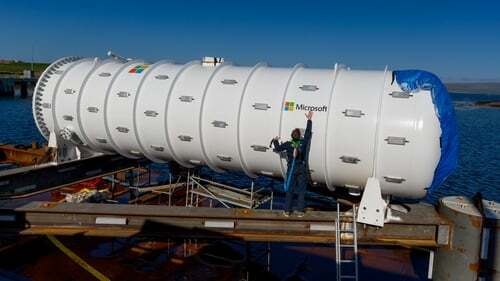 Microsoft has sunk a datacentre off the coast of Orkney to create a quicker and "eco-friendly" internet. The 40 foot cylinder is powered by tidal turbines and wave energy converters, using the water to cool naturally. Microsoft is exploring the idea that data centres can be based on the sea floor. Phase two of its research project has just begun in the Orkney Islands, where a more eco-friendly data centre was lowered into the water. "The shipping container-sized prototype, which will be left in the sea for a set period of time before being recovered, can hold data and process information for up to five years without maintenance," the company said. "Despite being as powerful as several thousand high-end consumer PCs, the data centre uses minimal energy as it's naturally cooled," it added. One way to do this is by placing them underwater near coasts, according to Microsoft, as more than half of the world's population live within 120 miles of a shoreline. After each five-year cycle, the vessel would be retrieved, reloaded with new computers, and redeployed. It is designed to be retrieved and recycled at the end of its lifespan.